As we gear up for summer, many of us are planning outdoor excursions to parks, oceans, lakes and mountains. One of the goals for me and my boys is to travel to as many Maine State Parks as possible this summer. I’ve got a vehicle pass for the parks and they’ve got a passport book in which to collect stamps. The sky’s the limit. This summer, share the beauty of your community with a Fresh Air child while enjoying the pure joys of summer in your own backyard! Thousands of volunteer host families in rural, suburban, and small town communities across 13 states from Virginia to Maine and Canada open their hearts and homes to New York City children from low-income communities through The Fresh Air Fund’s Volunteer Host Family program. The Fresh Air Fund, an independent, not-for-profit agency, has provided free summer experiences to more than 1.8 million New York City children from low-income communities since 1877. Host families open their homes to children who might not otherwise be able to enjoy a summer away from New York City. Fresh Air children experience simple pleasures like running barefoot through the grass, swimming in a cool lake, and gazing at star-filled skies. Through the eyes of Fresh Air children, families often rediscover the beauty of their own communities. Do you remember Michelle’s guest post about the Fresh Air Fund last year? Michelle’s family hosts a Fresh Air Fund child every year. As Michelle explains, it’s more than just a summer experience. I hope to become a Fresh Air Fund host family sometime in the future. 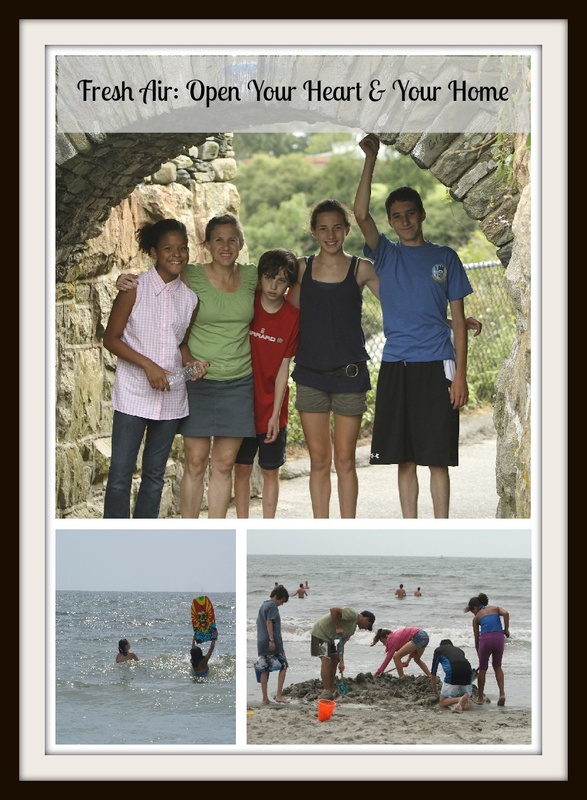 What child wouldn’t want to explore Maine for a summer? For now, I encourage you to check out Michelle’s post once again and consider being a host family for the Fresh Air Fund. If you are ready to take the next step, contact Amy Goodwin at 207-208-6510 or visit The Fresh Air Fund at www.freshair.org. I do remember that post! I thought it was such a wonderful idea and way to help out kids! Sounds like something I’d like to do one day too! It sounds like such a great experience for the kids and the host families. Definitely a win-win situation. anotherjennifer recently posted..Women Entrepreneurs: Read This Book! Yes! I was just thinking all about Michelle before I got to the part about her. It’s HUGE for her family. I love her telling me about it. We have the most perfect setting for it – acres of woods, water, mountains, etc. I’ve been looking into it. Tamara recently posted..Happy Birthday, Happy (Early) Father’s Day, Happy Trails! You do have the perfect setting, Tamara. How fun that would be! Awww…thank you for mentioning the Fresh Air Fund!! Of course! And you know what’s funny? G brought home a Fresh Air Fund flyer from school on the same day! As SOON as I started reading this post, I immediately thought of Michelle’s!!! I am just so inspired by her story and this beautiful idea to help and nurture so many children through experiencing nature at its finest. It’s something so many of us take for granted! I’m so so glad you shared this and reinforced just how much Fresh Air Fund can make a difference in children’s lives. Michelle is a great spokesperson for the Fresh Air Fund. It really is a great organization. Ha! Well, we’ll have to make sure we spray you with bug spray when you visit Maine then, Iva! I remember reading about Michelle’s experience last year before I met her and thinking what a generous soul she is. This was so uplifting to read today and I hope I get to be a host family one day myself! This sounds like a truly life-changing experience, both for the inner city child and the host family. The feeling of being surrounded by nature is like no other, and it’s easy to forget that not all children get to experience that. I agree, Katie. We had the opportunity to bring my nephew to see the ocean for the first time last year. It was so special! I love this. I worked at a summer camp in college, we had a similar week. Kids from only thirty minutes away had never seen Lake Michigan. It’s amazing, isn’t it? But so fun to be able to give kids those type of opportunities. I’m sure they remember the experience forever. This sounds like such a great program and such a wonderful experience for the children and families involved. I don’t know if I had read Michelle’s guest post last year, but I just read it. I think it is so amazing that she and her family have been doing this for so long; it sounds like they and the girl they host have formed quite a bond! Bev recently posted..Jewelry for a Cause: Have your say! It does, Bev. It’s great that she’s become like another member of the family.